Coastal Magic Convention 2017 Registration Now Open! Today’s the day… today’s the day!!!! Today is the opening of Coastal Magic’s 5th Annual event’s General Registration! It’s hard to believe it’s been 5 years, yet Jennifer Morris started planning Olde City, New Blood (Coastal Magic’s original incarnation) in early summer, 2012. From what she says, that first year was… well… it was a lot of fun, and certainly a learning experience. From my experience attending last year. It’s come a long way, and developed into quite a community of authors and readers, and still a boat load, or maybe beach load of fun. That being said … it’s time to get yourself registered to join us next year!! Coastal Magic is, by design, a small event. The registration (which is $90 and covers all our scheduled activities, and your lunch with an author on Saturday) is capped at 250 readers/bloggers. We came *really* close to selling out of registrations last year, so if you know you’re going to be coming to hang with us by the beach in February, we suggest getting yourself settled earlier rather than later! You just need to go to the REGISTRATION page of this site, and after you check out the details, you can click the EventBrite.com button there to buy your full weekend ticket. Jennifer is doing the hotel reservation process a bit different this year. You’ll receive an email containing our group code and reservation page link after you complete your registration. She’s hoping this will slow down the “sellout” problem on our reserve block, as only those who’ve registered will have access to the room reserve info. You can still see the hotel info and fee details on our HOTEL/TRAVEL page as a reference. And FYI, she’ll also list multiple, very nice and reasonably priced hotels within easy walking distance of our Hilton… as she anticipates we’ll sell out again this year. I’m sure there’ll be a lot of questions to answer and/or clarifications to make. You can comment on this post, or reach Jennifer on our Coastal Magic Convention Authors & Attendees Facebook Group. You can also reach her via the contact form and/or email on the CONTACT page of the Coastal Magic Convention site. I’m super excited, today has finally arrived. Now all the fun can really begin. 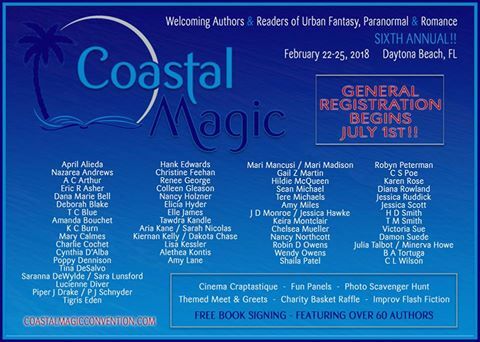 Once you’ve registered, you will definitely want to join the Coastal Magic Convention Authors & Attendees Facebook Group if you haven’t already. You’ll also want to check out our CMCon17 Featured Authors Reading Challenge group for the reading challenge which starts today as well. It’s a great way to check out the different author’s books, have some fun, and win some prizes at the same time. Since Books, Coffee, and Crafts News is one of the “Featured Bloggers” this year, I get the privilege of hosting one or more of Coastal Magic 2017’s “Featured Authors” each month until the convention. Isn’t that awesome. Look for my Coastal Magic 2017 “Featured Authors” Get Crafty spotlights in the coming months. Starting the countdown to #CMCon2017 — can’t wait to see you all next year by the beach!! Today we are sharing an incredible giveaway hosted by the 2016 ‘Best First Book’ RITA Nominated Authors! They are giving away 2 $50 Amazon Gift Cards, and a copy of each of the nominated titles. There will be 3 winners total. Be sure to sign up below and check out the authors who are participating and their incredible titles. When it comes to business, Avery King always comes out on top. So after a very public breakup, work is the perfect excuse to flee the Windy City for the gentle breezes of Aspen, Colorado. Her mission: acquire the land of a rundown mountain ranch. Avery expects an easy win . . . until she meets the rugged and irresistible rancher who won’t give up his property without a fight. Bryce Walker is stunned by the stubborn beauty determined to get what she wants. But what she wants is his last connection to the life he used to have. Bryce has plans to return the ranch to its former glory and no way will he sell his family home. Yet the more time he spends with Avery, the more her sweet touch makes him forget his painful memories. Now Bryce must decide whether living in the past is worth losing his future . .
Night Hush is a 2016 RITA® nominee for Best First Book, and the winner of the New England RWA’s Reader’s Choice Award. When Army Intelligence officer Heather Langstrom’s military convoy is ambushed and she’s taken prisoner, she knows she’ll need all her strength and courage to survive, escape her captors, and report the whispers of unrest brewing in the Middle East. Delta Force Captain Jace Reed isn’t one to throw caution to the wind, but when his team stumbles upon beaten and weak Heather fleeing the terrorist training camp they’ve been dispatched to destroy, he’ll risk everything to get her to safety. Once back on base, they learn her convoy’s ambush was no accident … she’d been targeted. As the evidence of an impending attack mounts, Jace and Heather uncover a deadly terrorist plot that could kill hundreds of civilians. But Jace’s protective instincts and Heather’s fierce independence put them at constant odds. And as they close in on the extremists, they must learn to trust one another in order to save innocent lives … even if it means sacrificing their own. “I know what you’re up to,” she said. “And what would that be?” he asked with a devious smirk. She looked over her shoulder to where he was still reclining against the wall, watching her patiently. All the reasons she’d vowed to stay alone, to remain uninvolved, fled as he grinned at her. In Scarlett Cole’s The Strongest Steel, Harper Connelly never expected to find herself outside of a tattoo parlor at one in the morning. The scars that decorate her back are just one more reminder of things she’d rather forget, the past she wants to leave far behind her, but before she can move on, she needs him. Trent Andrews has his own reasons for specializing in inking over scars. And there’s no way in hell he’s going to turn Harper away. Not when a swirling mix of tenderness and desire slams into him every time he sees her. Being with Harper is like going ten rounds in the ring―exhilarating, powerful, and dangerous. She stirs feelings in him he thought were long gone… if he can only get past her carefully constructed defenses. Running was the only thing that saved Harper last time, but each session at Second Circle Tattoos brings her closer and closer to Trent. His lingering touches seduce her, making her believe in a life without fear, where she can be happy, whole, in love. But when cryptic messages start appearing on Harper’s phone, strange deliveries arrive at her door, and Second Circle is vandalized, Harper is convinced that her ex-boyfriend has tracked her down, and worse, that he knows about Trent. She ran from her past once before; this time will she have the strength to fight back? The sickness came on suddenly and violently. When it was done, waitress Blue Michaels was different in a really strange way. And the entire town of Glory was dead…except for her. Only that’s not exactly true. A handful of people made it, including U.S. Army Specialist Seth Campbell, who was caught in the wrong town at the worst time. He’s fierce and protective, and way too good-looking. As much as they need a leader—as much as Blue wants to trust him—there are too many questions and not enough time for answers. Now they are hunted. But what their pursuers don’t know is each of them has strange new powers. And they’ll use their “gifts” to survive…no matter who stands in their way. Immortal Vikings are among us. Leif Skarsganger and his elite band of immortal warriors have been charged to protect humanity from the evil Norse god Loki. Under attack from Loki’s minions, Leif is shocked to encounter a dark-haired beauty who fights like a warrior herself. Wounded and feverish, the Viking kisses her, inadvertently triggering an ancient Norse bond. But when Naya Brisbane breaks away and disappears before the bond is completed, Leif’s warrior spirit goes berserk. If Leif doesn’t find her fast, he’s going to lose himself to permanent battle fury. But Naya doesn’t want to be found…and he’ll do anything to track her down. Because they’re both running out of time. Lady Miranda Hawthorne acts every inch the lady, but inside she longs to be bold and carefree. Entering her fourth Season and approaching spinsterhood in the eyes of society, she pours her innermost feelings out not in a diary but in letters to her brother’s old school friend, a duke–with no intention of ever sending these private thoughts to a man she’s heard stories about but never met. Meanwhile, she also finds herself intrigued by Marlow, her brother’s new valet, and although she may wish to break free of the strictures that bind her, falling in love with a servant is more of a rebellion than she planned. When Marlow accidentally discovers and mails one of the letters to her unwitting confidant, Miranda is beyond mortified. And even more shocked when the duke returns her note with one of his own that initiates a courtship-by-mail. Insecurity about her lack of suitors shifts into confusion at her growing feelings for two men–one she’s never met but whose words deeply resonate with her heart, and one she has come to depend on but whose behavior is more and more suspicious. When it becomes apparent state secrets are at risk and Marlow is right in the thick of the conflict, one thing is certain: Miranda’s heart is far from all that’s at risk for the Hawthornes and those they love. It’s Callie’s seventeenth birthday and, like everyone else, she’s eagerly awaiting her vision-a memory sent back in time to sculpt each citizen into the person they’re meant to be. A world-class swimmer. A renowned scientist. In her vision, she sees herself murdering her gifted younger sister. Before she can process what it means, Callie is arrested and placed in Limbo-a hellish prison for those destined to break the law. With the help of her childhood crush, Logan, a boy she hasn’t spoken to in five years, she escapes. But on the run from her future, as well as the government, Callie sets in motion a chain of events that she hopes will change her fate. If not, she must figure out how to protect her sister from the biggest threat of all-Callie, herself. American figure skater Carrie Parker’s Winter Games dreams were dashed when her philandering partner caused one of the greatest scandals in skating history. Blacklisted from competing in the United States, her career is over…until she receives a mysterious invitation and is paired with the most infuriating, talented—and handsome—skater she’s ever met. Russian champion Anton Belikov knows sacrifice. He gave up a normal life and any hope of a meaningful relationship to pursue his dream. And he’s come close—with a silver medal already under his belt, the next stop is the gold. All he needs is a partner. While he’s never forgotten the young American skater he seduced one long-ago night in Amsterdam, he never expected to be confronted with their past…never mind share the ice with her. When what starts as a publicity stunt grows into something real, Carrie and Anton’s partnership will test their loyalties to family, country and each other. With only a few months to train for the competition of a lifetime, can they master technique and their emotions, or will they lose their footing and fall victim to the heartaches of their pasts? Voting Links – A winner is chosen from each site. FINAL ROUND: Book Spotlights from each finalist cover will be run on both pages and websites. Highest number of votes/likes totaled between all pages and websites. Winning Covers to run on our FB Page’s Cover Photos, and Graphic Award on websites. A Book Spotlight of winner’s choice (does not have to be winning cover) to run on both websites and FB pages. A winner is chosen from each site.